Mischa Zverev takes out Russian veteran Mikhail Youzhny to set a second-round showdown with Roger Federer at the MercedesCup in Stuttgart. Watch as Mischa Zverev crushes a backhand past Mikhail Youzhny at the MercedesCup in Stuttgart. Mikhail Youzhny lets it rip against Mischa Zverev at the MercedesCup in Stuttgart. Highlights from Cuevas's first round victory over Youzhny in round one of the 2018 Australian Open. Roger Federer defeated Mikhail Youzhny 1-6, 7-6 (3), 6-4, 4-6, 6-2 in the U.S. Open's second round. 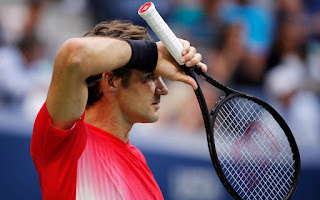 Federer set aside an uncharacteristic 68 unforced errors and what appeared to be a bad back, managing to pull out his second five-set victory in a row at the U.S. Open by coming back to edge Youzhny . It is the first time in his long career that the 36-year-old Federer has played five-setters in both the first and second rounds at a Grand Slam tournament. Watch Hot Shot as Mikhail Youzhny hits a scorching winner to take the opening set against Daniil Medvedev. Mikhail Youzhny passes Marin Cilic at the Swiss Indoors Basel for a winner. Mikhail Youzhny catches Stan Wawrinka by surprise with a cheeky drop shot during their second-round match in Toronto on Tuesday. 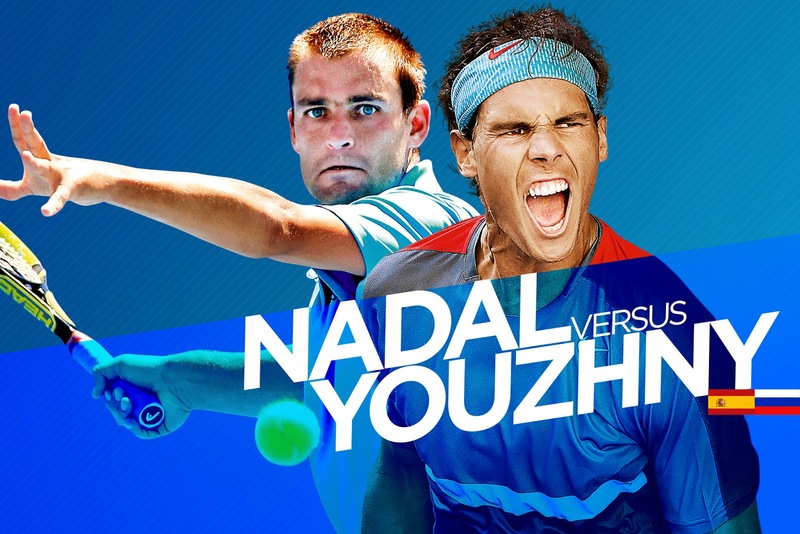 Rafael Nadal opens his Australian Open campaign against Mikhail Youzhny. Rafa, ranked 3rd in the world, played Youzhny, ranked 49th, 15 times and he won 11 of those encounters. 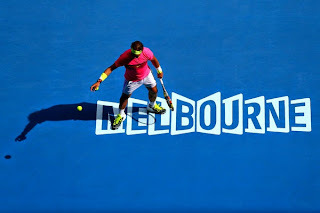 At the Australian Open they played just once, in 2005 where Rafa won 6-1, 4-6, 4-6, 7-5, 6-3. Roger Federer defeated Mikhail Youzhny 6-1, 6-4 to advance to the Gerry Weber Open final in Halle. The Swiss broke twice to wrap up the first set in just 21 minutes. He was in such control that one fan implored him to slow down. He broke twice more, before dropping serve to lead 5-3 and then missed three break points in the next game. Federer was able to seal the match in the next game with his seventh ace. In the final he will face Philipp Kohlschreiber or Tommy Haas. Roger Federer defeated Mikhail Youzhny 6-3, 6-4 to advance to the semifinals of the Dubai Tennis Championships. Federer served solidly and was in good form at the net. 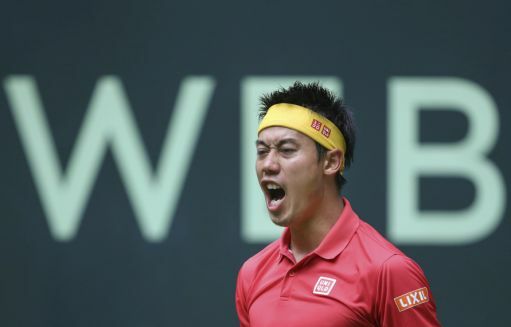 He broke to go up 3-2 and won the opening set when Youzhny failed to return his serve. The second set was much the same, Federer was never headed after breaking to lead 1-0. He clinched the match with a kick serve that Youzhny returned into the net. Federer will play either Juan Martin del Potro or Jo-Wilfried Tsonga. Mikhail Youzhny beat Lukas Lacko 6-2, 6-3 to win the Zagreb Indoors 2012 title. Youzhny faced no break points and lost only 12 points on serve during the 68-minute match. After both players won opening service games, Youzhny won eight of nine games, winning the first set and three games in the second. Lacko then kept his serve until the end of the match but could not challenge Youzhny. Lukas Lacko of Slovakia reached his first ATP final when he ousted 2007 champion Marcos Baghdatis 7-5, 7-6 (3) in the Zagreb Indoors semifinals on Saturday. Lacko, playing on the main tour since 2007, will face third-seeded Mikhail Youzhny, who is seeking his eighth title in his 18th career final. Youzhny advanced with a 6-3, 6-4 victory over Michael Berrer of Germany. Lacko has eliminated three seeded players in Zagreb. Rafael Nadal defeated Mikhail Youzhny 6-4, 6-4 in the quarter-finals at the Qatar ExxonMobil Open. "I think I played really well. 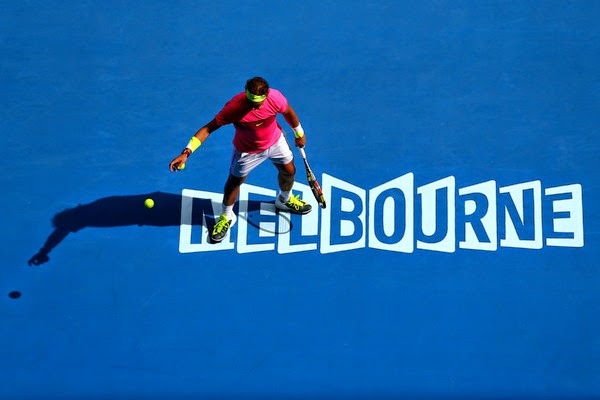 The end of the match was a little bit nervy but the rest of it was good," Nadal said. "I'm feeling a little better each day and I'm enjoying the tournament and being in Qatar." Rafa won 75 per cent of his first serve points, and was proficient at the net, taking 8 of 9 points when he came forward to win for the ninth time in 13 meetings against Youzhny. "I think I was moving fast. I tried to go to the net a lot of times," said Nadal. "That's what I need to keep doing if I want to compete against the top players. Mikhail is a fantastic player and it was tough. But I think I did well." Mikhail Youzhny has graduated from the University of Moscow with a PhDs in Philosophy. Youznhy answered approximately 20 questions about his work before all 16 members of the scientific council approved his PhDs. "I took my coach (of 17 years), Boris Sobkin, and my family and friends as well, and the guy who helped me with the degree," said Youzhny. "There were some professors from the university there. I was a bit nervous because it was something new, it’s not like a tennis match I’m going to play, which I do every week. I was answering questions and reasoning, so of course it’s different. But actually, when I think about what I said, it’s my life, what I’m doing every day on court." The Russian began studying for the degree in 2005, knowing that with limited free time as he competed on the ATP World Tour 11 months of the year, it would take him longer than the usual three-year period to complete it.